What is the Lighting of Tomorrow SMART SAVINGS L.A.A.S. Program? Your L.o.T. Project Manager will determine whether you qualify for this program by conducting a thorough audit of all existing lights at your property & determining where you can save energy. Your L.ot. Project manager will present you with a preliminary report and walk you through the entire process. How are lighting savings determined? Your monthly savings are calculated based on the cost of operating your current lighting system (energy usage, maintenance costs, etc.) compared to the projected future cost of operating your new, energy-efficient, lighting system. This savings calculation is the basis for your affordable monthly payments. What are the benefits of Lighting as a Service? What happens at the end of the Service Agreement? Lighting of Tomorrow maintains the ownership and responsibility for the lighting system for the entire period of the Service Agreement. At the end of your Service Agreement, you will have the option to either continue service under a new agreement or to buy the existing lighting system at the price quoted by your L.o.T. project manager in your preliminary report. 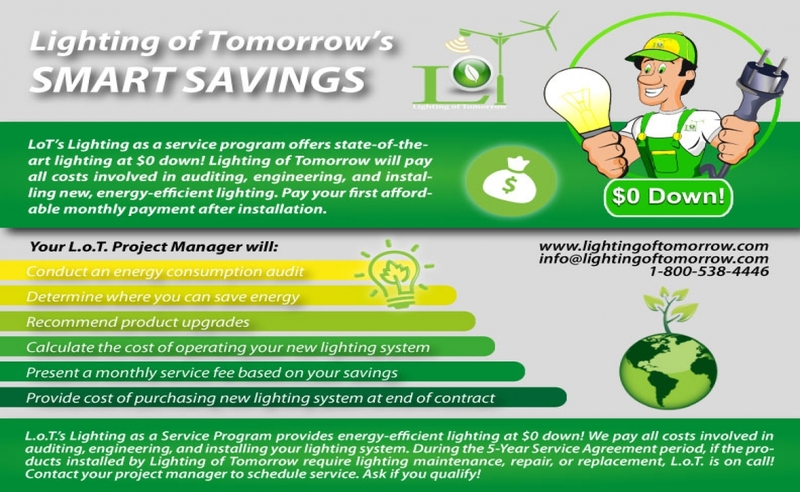 L.o.T.’s SMART SAVINGS Lighting as a Service Program provides you with an affordable way to achieve energy-saving lighting.